the "Nevada," the voyage lasting eleven days. They located near Lincoln, Nebraska, and there David completed his education. He came to Custer county in the spring of 1883, remaining with his father until his marriage, December 22, 1897, to Miss Nellie May Slingsby, the affair being a double wedding and taking place on the old Collier homestead, Mr. Collier's sister, Elizabeth, becoming the wife of John Garness at the same time. The Slingsby family were among the pioneers of Custer county and prominent in all affairs of interest to the community. After marriage Mr. Collier brought his wife to their home on the northwest quarter of section twenty-nine, township seventeen, range seventeen, where they began housekeeping in a soddy the following summer, and lived in this for eleven years, when a neat, modern cottage home was erected. They now have four hundred acres of well improved land and have a well equipped stock and grain farm. Mr. Collier is a wide-awake, hustling farmer, progressive in his ideas and methods, and making the most of his chances for success. He is actively interested in any public movement that is calculated to advance the common good of the community or county, and is highly respected as a good and useful citizen. He and his wife have three children, namely: Mary Janet, Alfred David and Alvin Field. Mr. Collier and his two brothers are neighbors, and all are extensive feeders and shippers of live stock. They are self-made men, and considered as among the more substantial men of the county, who perform their duties in a quiet way, and keep constantly in mind the general welfare of the state, where most of their lives have been spent, and for which all have a patriotic sentiment. Mr. Collier was reared in the Presbyterian church. Politically he is a republican, but votes independently of party lines if he prefers another candidate. He is a member of the Odd Fellows and of the Modern Woodmen. An early experience of Mr. Collier, when he was a boy, is well worthy of mention. He herded cattle for eight years, and one day, while with the herd, he came suddenly upon two mountain lions, riding to within fifty feet of them. When he realized what the strange animals were, he backed his horse away from them a distance and then, gave them wide berth, having no firearms with him. His story was doubted by many until others saw the beasts in the vicinity, and confirmed his story of their presence near. 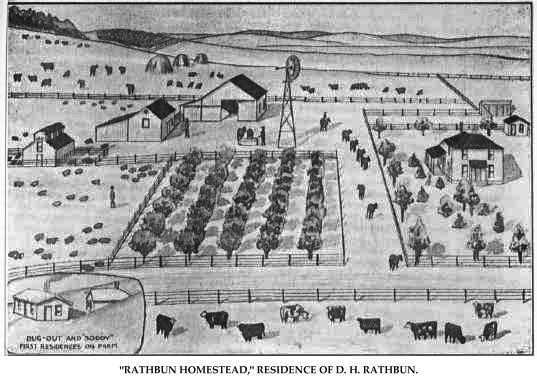 Dimic H. Rathbun, one of the prosperous agriculturists of Valley county, Nebraska, owns a good farm of three hundred and sixty acres in section twenty-two, township nineteen, range thirteen, Valley county, Nebraska, and is a progressive and industrious member of the community. Mr. Rathbun was born in Steuben county, New York, August 29, 1852, and was second of eight children in the family of Hiram and Louise (Sherer) Rathbun, who had five sons and three daughters. He was the eldest son, and was raised on a farm. Mr. Rathbun is practically a self-made and self-educated man, going out for himself in his twenty-first year. He had bought a farm in Steuben county, and farming and stockraising was his occupation. In March, 1877, Mr.. Rathbun gave his farm in Steuben county to his parents, and came by train to Grand Island, Nebraska, having but one dollar left on his arrival. From there he footed it up to the Loup river valley country, taking up a homestead in the southwest quarter of section twenty-two, township nineteen, range thirteen, and he has made this his home until this date, being the only original homesteader in Springdale township to remain on his first tract of land. There are probably only two others that reside on the old homestead farm north of the river so far as the Valley county line extends north and east. Mr. Rathbun landed in Valley county without means, being obliged to freight from Grand Island to secure funds for living expenses, and broke prairie for others even before he turned a sod on his own land. He now has one of the best farms in the county, there being, its stated before, three hundred and sixty acres in his residence farm. He also has other valuable farms in Valley county, he and his sons owning upwards of seven hundred acres. He is a successful and prosperous man, and has had much to do with the development of the county. When a new bridge, road or other improvement is desired, Mr. Rathbun is usually on the committee, and seldom fails to secure what is desired. He has always given of his time and means toward the betterment of all conditions along progressive lines. of United Workmen, and is also a member, with his wife, of the Degree of Honor. Mr. Rathbun and family passed through the adverse years of Valley county, losing all their crops during the drouth of 1894, and two years hail ruined their prospects. However, by energy and thrift they have accumulated considerable of this world's goods. For several years they lived in a log front dugout, with a dirt roof, near which was later built a house covered with boards, tar paper and sod. This was later replaced by their present substantial residence, of which we give a view elsewhere in this work, with its surrounding barns and outbuildings. Mr. Rathbun's log house, recently constructed after his own plans, is something unique in farm buildings. The floor is of clay, held in place by wire fencing, preventing its being torn up by the swine, and at the same time avoiding the chill of granitoid, while the ventilation and movable partitions make it one of the most convenient farm buildings the writer of this sketch ever saw. Mr. Rathbun has often seen from his cabin door on the homestead, elk and deer come out in the open and play on the bank of the Loup river. He was one of the posse to follow the famous Doc Middleton on one of his raids into the Loup country, but losing the trail they could not again locate the outlaw. The Rathbun family are extensive shippers of stock, Mr. Rathbun often shipping two hundred and fifty head from their little station, Sumpter, while his sons ship twice as many more. He has at in times a goodly number of young stock on the place, raising many and purchasing more. "Rathbun Homestead," Residence of D. H. Rathbun. Gardner Housel and wife are among the very earliest pioneers of central Nebraska and have been residents of Custer county since 1879, a period of more than thirty years. Mr. Housel was horn in New Jersey, September 18, 1847, fifth of the twelve children of Furman and Margaret (Carpenter) Housel. He has a brother, Phillip, in Hamilton county; a sister, Mrs. Sarah Beet, living in the same county; one brother in Colorado, one in Wisconsin and one in Washington city; others of the children are now deceased. Both parents were born in New Jersey and the mother was of German descent. The father died in Wisconsin in 1892 and the mother in 1895. In early childhood Mr. Housel accompanied his parents to Dane county, Wisconsin, and there reached manhood, receiving his education in the country schools. He was reared on a farm and when he reached young manhood began farming on his own account. In the spring of 1870, he went to Nebraska in search of land on which he would care to settle, and homesteaded eighty acres between Sutton and Aurora, in Hamilton county, where he lived about nine years. Mr. Housel was married in Otoe county, Nebraska, December 2, 1872, to Miss Jennie Cook, a native of New York City, who came with her parents, Lawson and Agnes (Jenkenson) Cook, to that county in 1857. Both parents were natives of Eggermount, Cumberland county, England, but did not know each other until meeting in New York. The mother was born in 1813 and came to America in 1838, and was running a small hotel. The father came about the same time, and a few years later was boarding at this hotel, and in 1841, married his hostess. Eight children have been born to Mr. Housel and wife, namely: Frank B, a farmer of Custer county, has four children; William A., a dentist of Ansley, also has four children; Charles Lawson, a physician of Ansley, has three children; Margaret A., wife of N. B. Sheldon, of Custer county, has two children; three daughters and one son are deceased. Mr. and Mrs. Housel lived on the home place in Hamilton county until 1879, when they came to Custer county and purchased three hundred and twenty acres in section twenty-two, township fifteen, range eighteen, which has since been the home place. It is well improved and equipped with everything necessary to carry on successful grain and stock farming. Mr. Housel has set out nine acres with fruit trees, a source of much pleasure to the family. He makes a specialty of polled Angus cattle, which he has raised extensively for the past twenty-five years. He is a prosperous and successful business manager and owns eight hundred acres of land in one body. He is an enterprising and useful citizen, interested in the welfare and progress of the county and state. In an early clay he was instrumental in organizing a school district at his home in Hamilton county, and later performed the same valuable public service in Custer county, in both instances serving as a member of the school board. Mr. and Mrs. Housel have passed through many varied phases in the history of Nebraska, and found it necessary to meet pioneer conditions and trials, Their first three years were spent in a dugout, and the frame house which succeeded it was the first of its kind in the county. The lumber was hauled from Kearney, fifty miles distant; thirteen trips being necessary for it and other supplies. Additions were added from time to time, and in 1912 a fine concrete block house was erected on the place. We are pleased to call attention to an engraving of all these on another page of this volume. the storm. The winter of the deep snow, 1880 and 1881, was severe on the settlers; the last snow of the season fell May 22, 1881. Mrs. Housel was herding their cattle on the prairies at the time and well remembers the circumstance. In the sudden and severe blizzard of January 12, 1888, Mr. Housel was returning with a load of straw; the wind was of such force that he got home with only the small amount on which he was lying. The two older boys were at school and remained at a neighbor's all night. Mr. Housel is independent in politics, and with his family, is a member of the Christian church. 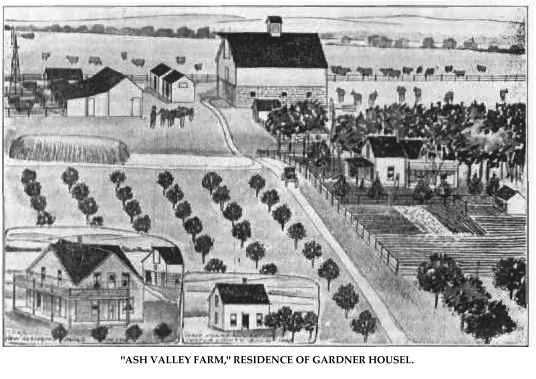 "Ash Valley Farm," Residence of Gardner Housel. Among the leading and substantial agriculturists of Pierce county, Nebraska, the gentleman whose name heads this review occupies a prominent place. Mr. Barnett was until recently the owner of a valuable estate in township twenty-seven, range three, but has moved from this well improved farm to the city of Lincoln. Mr. Barnett is a native of Missouri, having been born in Barton county, that state, February 23, 1869, and is the son of James and Jane (Knowles) Barnett. Our subject's father served four and a half years in the civil war on the union side, in Company K, Thirty-third Illinois Volunteer Infantry, and participated in the Siege of Vicksburg. Mr. Barnett, in his childhood, moved with his parents to Appanoose county, Iowa, where he spent most of his boyhood days, securing what education he has in the district school. In 1879, the family moved to Saunders county, Nebraska, south of Fremont. In 1894, Mr. Barnett was united in marriage to Miss Mary Simpson, to which union three children have been born: Clair C., Harold J. and Anna. In 1906, Mr. and Mrs. Barnett came to Pierce county, Nebraska, where they purchased three hundred and twenty acres in section eight, township twenty-seven, range three, near the station of Breslau. This he sold in 1910 and moved to Lincoln that his children might enjoy the advantages of the state agricultural schools. In religious faith, Mr. Barnett adheres to the Presbyterian church, and in politics votes the republican ticket. He is a member of the Modern Woodmen, and is highly respected by all who know him. Ward W. Barnes, who for the past many years has been identified with the farming and business interests of Howard county, has also taken an active part in the political and official life of that region. While pursuing his career he has done his full share in helping to build up the vicinity and has become prosperous and successful, now being among the popular men of his county. Mr. Barnes was born in Allegany county, New York, June 30, 1854. At the age of three years he accompanied his parents west, they locating in northern Illinois, where they lived for about six years. They also lived in Warren county, Illinois, for a number of years, and in 1873 removed to Iowa, settling on a farm in Ringgold county. During the third year of their residence in that state our subject started in life for himself, beginning farming on his own account, also worked out by the month. He was married on the twentieth day of March, 1881, to Miss Mattie Shaffer, of Ringgold county, Iowa, and the following year they came on to Valley county, Nebraska, remaining one year. In the spring of 1883, they moved to Greeley county, settled on a rented farm, spent a short time there, and then took up a homestead of one hundred and sixty acres in Custer county, the family taking possession of their new home in the following spring. They remained there but one year then relinquished on the claim and returned to Greeley county, living there for one year. Their next move was into Howard county, where Mr. Barnes worked rented land for about ten years, then purchased one hundred and sixty acres situated in sections twenty and twenty-nine, township sixteen, range twelve, which tract was mostly under cultivation, and for which he paid three thousand two hundred dollars. He remained on the farm up to 1906, then sold out for eight thousand dollars, showing the phenomenal rise in land values during that time, although, of course, he had added various improvements to the place. In the spring of 1906 he purchased a ten-acre tract just at the edge of Cotesfield, and built thereon a comfortable residence, which he still makes his home. Mr. Barnes is an active public-spirited citizen, a populist in politics, and has served officially in Elba precinct from 1898 to 1905, inclusive, as assessor during most of that time. In the fall of 1906 he was elected county commissioner and re-elected in 1909, which office he is still filling. During his residence in Greeley county he held the office of treasurer of the county, also was a Member of the Union district school board. Mr. Barnes' first wife died on May 10, 1894, and two years later he was married to Miss Mary Cook, of Howard county. There were seven children born of the first union, named as follows: Etta, Earl and Goldie, all married and settled in comfortable homes in Howard county; Mary and Mabel, are employed as long distance telephone operators in the St. Paul offices of the telephone company, while Claude and Reuben are both farming near Cotesfield. The four children resulting from Mr. Barnes' second marriage are: Lester, Edmond, Emil and Armel May, all living at home. Andrew Pierson, one of the prosperous farmers of Sherman county, is one of the old settlers that locality, and can recount many interesting experiences and incidents of his early life in Nebraska. He is the proprietor of a fine, well improved stock farm of about five hundred and twenty acres, and is reckoned among the progressive farmers of the community. Mr. Pierson was born near Maryholm, Sweden, January 8, 1850, and he was the third in a family of four children, only three of whom are now living. The parents never left the old country and the father died there in 1854, the mother 1880. Mr. Pierson passed his boyhood and youth in the old country, and received his education there. He came to America in 1871, sailing from Copenhagen to Hull, England, and embarked at Liverpool for Quebec, whence he traveled by rail and river to New York. He located in New Jersey, working in the ore mines at Oxford for a time, and later went to Shugenants, Warren comity, Pennsylvania, where he worked in the coal mines two years. After a visit to his native land, Mr. Pierson came west in the fall of 1877, and engaged in farm labor in Burt county, Nebraska. In 1881, he came to Sherman county, where he took up a homestead of one hundred and sixty acres on section two, township sixteen, range sixteen, which has been his home ever since; as he prospered he purchased adjoining land in sections one and two, until acquiring the acreage above mentioned. On the thirty-first of August, 1893. Mr. Pierson was married in Loup City, to Tilda Neilson, also a native of Sweden, who came to America in 1893 with Mr. Pierson on his return from a visit to the home land. Five children have been born to them, named respectively: Carl A., Selma, Alma, Albin, Arthur, deceased, and Arthur, the second of that name, all at home. Henning Pierson, a son of Mrs. Pierson, is married, and lives in Sherman county. For thirty years our subscriber has been identified with the agricultural interests of the locality and he has aided materially in transforming this region into a thriving farming district. He has always been interested in educational matters and for twelve years served as treasurer of the school district, number twenty-seven. During his first year in the west Mr. Pierson batched in a small dugout with a sod front; he later erected a more commodious sod house, which was the family residence until 1888. Mr. Pierson was reared in the Lutheran church. In politics he is a republican. In compiling a list of the prominent pioneers of Madison county, Nebraska, we mention Peter Etling as being one of the true old-timers, he having located here in the fall of 1881, and since that time being intimately identified with the growth and progress of the region. He has always taken an active interest in the affairs of his community, aiding by every means in his power the development of the agricultural and commercial resources of his part of the state, and has incidentally, through thrift, good management and economy, succeeded in accumulating a goodly portion of this world's goods to protect himself and family from discomfort in old age. Mr. Etling is a native of Ohio, born in Holmes county, November 18, 1843. His parents were born and reared in Prussia, they coming to America about 1842. The vessel in which they made the trip was a sailboat, and, like many other emigrants, experienced considerable hardships during the voyage, which consumed thirty-eight days. Often the sea was very rough and the little boat was in danger of being swamped by the great waves which swept over her, but a safe landing was finally made, and the passengers scattered to their various destinations, Mr. and Mrs. Etling going directly to Ohio, where they now live. Peter was educated in his native county, attending the country schools. He followed farming during his young manhood years, and achieved a certain measure of success, but became dissatisfied with conditions in the east, so, in company with his wife and children, came west, arriving in Madison county in April, 1881. The following year he bought the Albert Berklin homestead and began farming. Their dwelling during the first year was a rough dugout, then a comfortable frame house was erected, and improvements added as fast as they were able. He had the usual experiences relative to loss of crops on account of the hot winds, storms, etc., and in the blizzard of 1888 was among those who suffered the loss of stock. However, in spite of all these setbacks, he continued to prosper, and became the owner of a finely improved tract of land consisting of two hundred and forty acres, all now under cultivation except what is needed for grazing for his stock, of which he has considerable, owning several head of thoroughbred Belgian horses, Poland China hogs and Hereford cattle, all registered stock. In 1869, Mr. Etling was united in marriage to Miss Catherine Emmig, and to them have come seven children, six of whom are now living, all settled in their own homes; except Mrs. Schindler, and doing their full share as worthy citizens of their respective communities. They are named as follows: Carrie, now Mrs. H. W. Decker; Sarah, Mrs. Peter Emmrick; Mary, who is the wife of Joseph Schindler; and Katie, Anna and John F., the latter three are unmarried. assist in promoting the best interests of the county, and is one of the substantial and trustworthy men of his community. He is a member of the Knights of Pythias, and the German Lutheran church. Walter M. Henderson was one of the very early settlers of Custer county and a member of a pioneer family. During his early years there he had many trying experiences, and passed through the years of severe storms, and the years of drouth, when crops could not be raised. He is one of the few men to retain possession of their original homesteads, a man of forceful character, self-made in every way. He is a native of Harrison county, Missouri, born January 21, 1861, second of three children of John F. and Mary J. (Williams) Henderson. The father was born in Paterson, New Jersey, August 7, 1828, and the mother in Muskingum county, Ohio, February 14, 1831. They were married in Ohio and during their early married life removed to Iowa, and before 1861 had removed from Decatur county, Iowa, to Missouri. While their son, Walter, was still in his infancy they returned to Iowa, remaining there until about 1868, when they returned to Missouri. The father was a cooper by trade and these removals were made as his business prospects seemed to dictate. They lived in Missouri until November, 1877, at which time the father and mother, with their two sons, Walter M. and Franklin E., came with a team and wagon over the prairie schooner route to Lillian Creek, Custer county. The father secured a homestead on section thirteen, township nineteen, range twenty, which remained the home farm until the title was proved. The sons were also original homesteaders in Custer county. On December 22, 1881, Walter M. Henderson was united in marriage, at New Helena, Custer county, with Emma G. Greenwood, daughter of George B. and Roenna Greenwood, of an early Nebraska family. Mr. and Mrs. Greenwood brought their family to the county in 1879. Mr. and Mrs. Henderson were married by Judge Matthews, of New Helena, the first justice of the peace of Custer county. In 1882, Mr. Henderson filed in entry on the farm which has since remained the home place, on the southeast quarter of section thirty-two, township nineteen, range seventeen, and a timber claim of eighty acres in the same section, making two hundred and forty acres altogether. Mr. Henderson hauled logs for the first cabin north of the river, from Cedar canyon. He erected a house on the homestead for himself and one on the eighty-acre timber claim for his parents, where they remained until the death of the mother on December 29, 1887, after which the father came to live with his son, Walter M. The father was injured by a falling tree on February 27, 1879, losing his right arm and receiving injury to his hip, from which he never fully recovered. In youth Mr. Henderson received a common school education, and early began to help with the work on his father's farm. From his eighteenth year he had the care and responsibility of his parents and faithfully performed these duties. In early days he freighted with an ox team from Lillian Creek to Grand Island and at times was on the road for ten days in making a round trip, camping out wherever night overtook him. At this time there was no house between what is now Walworth postoffice and the village of Comstock. He says the companions of these trips were Texas cattle, jack rabbits, coyotes, and the whisperings of the winds. He is one of the successful farmers of his part of the county and also has a creamery business at Comstock. Mr. and Mrs. Henderson are the parents of four children, three of whom now survive: Walter L., married, and living five miles south of Comstock, has three children; the second child died in infancy; Elmer F., married and living on part of the old homestead, has two children; and Ethel Belle, at home. All were born on the home farm, and educated in the local schools. Fred Koebke is one of the older residents of Wayne county, Nebraska, and since coming to that region has been actively interested in every measure for the public welfare. He has contributed his full share to the betterment of conditions, and as a private citizen has proven himself public-spirited and enterprising. He is a native of Germany and was born January 3, 1862, a son of Ernest and Myra Koebke of Pommerania, Germany. The parents spent their entire lives in Germany, where the father was engaged in farming. Mr. Koebke was one of eight children and remained with his parents until some time after reaching his majority. He received the usual education to be had in the public schools of his native place, and was reared to the work of farming, and served three years in the Germany. where he carries on a general line of farming and raises considerable stock of various kinds. He is well known as a man of industry and determination, and is regarded as an intelligent and progressive farmer. He follows modern methods of carrying on his work, has improved machinery to help him in it, and is one of the influential citizens of the county. He has made many friends and enjoys the respect and esteem of all. His house was erected about 1895. The gentleman whose name heads this personal history, now deceased, during his life time, held a high position among the leading citizens of Merrick county, Nebraska. Calvin B. Hartwell was born on a plantation in Virginia in the year 1810, and while he was still an infant his parents moved to Massachusetts, where he lived until about his twenty-seventh year. Mr. Hartwell was joined in wedlock to Miss Elizabeth Ragsdale, a native of Indiana, in the year 1837, at Washington, Indiana. After marriage, Mr. and Mrs. Hartwell migrated to Hillsboro, Illinois, where they made their home until 1849. Four children were born in Illinois: Lucy A., Thomas J., Caroline S., and Mary Elizabeth. In 1849 the family moved to Worth county, Missouri, where they resided until June, 1862. The Hartwell family arrived in Douglas county, Nebraska, in June, 1862, the family consisting of father, mother and six children, two boys and four girls; five children were born in Missouri, namely: John C., Laura J., Hannah R, Malina Alice and Amos E. The children who came with the parents were the six youngest, the three eldest having married and made homes of their own. The family lived at Bridgeport on the Military road, and Mr. Hartwell was connected with a tavern, or inn, so called in those days. In the latter part of March, 1865, the family came to Merrick county, Nebraska, where they were original homesteaders of that county on section twenty-eight, township fifteen, range four, and this remained the residence until the time of Mr. Hartwell's death, on February 25, 1878. Mr. Hartwell was an educated man, being a graduate of Harvard, and always took an active interest in the upbuilding of his home county and state, and several times was called upon to serve Merrick county as commissioner. After Mr. Hartwell's death, the family made the farm their home until 1882. At this time the children had married, excepting Amos E. and Malina Alice, who were on the farm with their mother. In 1882 the family became separated, and Mrs. Hartwell went to live with her son. She now resides in Clarks with her daughter, Mrs. Hans Kokjer, and is in her ninety-first year. Mrs. Hartwell has had a busy life and passed through pioneer days in several states, and is a woman loved by all. Amos E. Hartwell, youngest son of the above mentioned, was born in Worth county, Missouri, March 27, 1860, and when he grew to his eighteenth year started out in life for himself, this being the year of his father's death. Mr. Hartwell had good schooling and always sought higher education. In his twenty-first year he taught the district school, after which he attended the Nebraska University from 1882 to 1884; then engaged in stock business one year, when he became interested in a general mercantile store in Clarks, Nebraska, until 1889. On May 4, 1887, in Clarks, Nebraska, Mr. Hartwell was married to Miss Ruth A. Richardson, a native of New York state, and who became a resident of Hall county, Nebraska, in 1871. Mr. and Mrs. Hartwell have seven children living: Edgar E., Merwyn A., Mary A., Laura E., Gladys E., Robert R., and Carl B., all of whom reside under the parental roof. Mr. Hartwell., after 1889, followed farming and stock raising until 1904, since which year he has handled live stock for the market. He is a successful and highly esteemed man, and the Hartwell family has always been widely known in this section of Nebraska, and have been prominent in business, social and educational circles. A leading old timer of northeastern Nebraska is found in the gentleman above mentioned, he having come to Pierce county about 1890, when that region was just beginning to be settled by many who had come to this new country to build up homes and fortunes through industry and perseverance, and who by dint of good management and often times much privation, have accumulated a competence to last them through their declining years. Mr. Dather resides in section three, township thirty-two, range eight, where he has a comfortable home and is held in high esteem by a host of warm friends and good neighhors. Mr. Dather is a native of Iowa, being born in Bremer county, that state, in 1865, a son of Henry and Salina (Jackson) Dather, the father being a native of Germany, and the mother being born in the state of Ohio. Henry Dather, our subject's father, came from Germany when he was a small boy with his father. His father, our subject's grandfather, having served in the German army in the war between Turkey and Germany, experienced many hardships, so he decided to come to America with his family where his sons would never have to go through the hardships and trials he had gone through in his native land, and such is the brief history of the Dather family's advent to American soil. Plainview, Pierce county, Nebraska, remaining there for one year, when, believing he could become more prosperous in Knox county in the same state, he removed to that locality: and in September, 1892, he took up a homestead in section three, township thirty-two, range eight, which old homestead farm has remained the residing place of Mr. Dather and family to this day. He built a good frame house at once on this land and "batched it" for about five years, when he married. Mr. Dather was united in marriage in 1897 to Miss Ella Jones, and Mr. and Mrs. Dather are the parents of a fine family of six children, named as follows: George, Mary, Henry, Salina and Margaret, and a baby son. E. M. Arnold, proprietor of one of the most valuable estates in Stanton county, Nebraska, has been a resident of that locality for a number of years. He is prominently known throughout the northeastern part of the state as one of the foremost farmers and stock men of the community. Mr. Arnold is a native of Washington county, Iowa, and was born in 1866, the son of William and Rebecca Jane Arnold. The family is an old one, and distinguished in many ways. His grandfather came from Wales, while the grandmother was of Scotch descent. The family first emigrated to this country in the early part of the eighteenth century, according to the records. The great great grandfather came to Virginia, and was an officer in the war of 1812. The subscriber's father came to Iowa in 1841, and took up a homestead there, when this was the frontier. An uncle also took up a homestead here, and still resides in this same county and township, having lived here for seventy years. He was a carpenter by trade, and built the first church in Washington county, also the last Methodist church, up to date. Mr. Arnold himself came to Stanton county, Nebraska, in June, 1884. he lived here three years, then moved to Daws county, and took up a homestead, building a sod house as his home there. Later he returned to Stanton county, and bought his present home. He has improved the farm in many ways since buying it, adding new buildings. building fences, planting groves and fruit, until now, as has been said, it is one of the most valuable farms in the county. In 1889, Mr. Arnold was united in marriage to Miss Ida Lowry, and four children have been born to them. They are: Jay Edward, Pearl Myra, Newton and Blanche. In politics, Mr. Arnold is a staunch republican, and takes an active interest in public affairs. His name is always foremost in the aid of every measure of tending to the development and building of the financial and social interests of the community. A typical pioneer of Nebraska is represented by the gentleman above named. Mr. Bligh has lived many years in this section of the country land has been a part of the growth and development of this region, building up for himself a substantial home and fortune by his perseverance and thrift, and has come to be one of the foremost citizens of Antelope county. Mr. Bligh was born July 7, 1841, and is a native of Madison county, New York state. From there he went to Berkshire county, Massachusetts, and while residing there the war broke out and he enlisted in Company E, Twenty-seventh Massachusetts Infantry, under Generals Burnside and Foster, Captain Trafton commanding. He took part in the battles of Roanoke Island, Newburn, Kingston, and Little Washington, North Carolina. He re-enlisted at Norfolk, Virginia, in December, 1863, then took part in the battles of Cold Harbor and Petersburg; his command then returned to North Carolina, where he was captured March 8, 1865, at the second battle of Kingston. He was sent to the confederate prison at Salsbury, then to Danville, and to Libby prison. He was released from Libby prison the night before Richmond fell. After the war Mr. Bligh went back to Massachusetts, remaining there for some time, then in February, 1867, moved to Janesville, Wisconsin, where he lived for two years, then to McHenry county, Illinois, where he remained until the spring of 1879, when he came to Nebraska. On February 9, 1864, Mr. Bligh was married to Miss Sarah J. Bowdish, and they are the parents of three children: Ella M., Etta, deceased, and William. In 1879, our subject with his family started for the west where they thought a young man had better opportunities to get a start in life. They drove from Illinois to Nebraska in a covered wagon and was four weeks on the road. Mr. Bligh took up a homestead in section thirty-four, township twenty-eight, range seven, and built a frame house thereon, living in the wagon until the house was built. They still live in this same house, but have added to it considerably until now the family have a comfortable and beautiful home which is called "Clover Lawn."